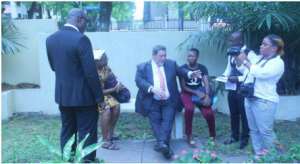 The Prime Minister of St Vincent and the Grenadines, Dr Ralph Gonsalves, together with a five-member delegation has paid a visit to George Padmore Research Library on African Affairs, a division of Ghana Library Authority as part of a five-day state visit in Ghana. Deputy Resident Librarian of the George Padmore Library, Simon Teye received the delegation and briefed them on the history and essence of the Library as a research hub in the country. The delegation, which included the wife of the Prime Minister, was taken through the various departments of the Library and introduced to some rare collection of the great Pan Africanist, who the library is named after. The Prime Minister who saw George Padmore as Mentor to him also visited the Tomb located on the premises of the library to pay his respect. Dr Ralph Gonsalves donated assorted books to the library and engaged some patrons of the library in a conversation. “I entreat you to take your studies seriously since that is the only way to achieve success in future. Remember to also to choose a partner who will add value to your achievement.” He advised the patrons. George Padmore Library for Research on African affairs is division of the Ghana Library Authority. It was established in June 1961 by Dr Kwame Nkrumah in memory of Malcolm Ivan Meredith Nurse, who changed his name to George Padmore when he became a champion of Pan Africanism. Born on 28 June 1903, in Trinidad, Padmore, was also a Journalist, and an Author. He followed by Pan Africanism dreams to settle in Accra. He died on 23 September 1959, in London from ill health. His ashes were, however, interred in Accra.